← Bobcats Breeding with Feral Cats? In the early days hunters often used cattle as hunting blinds, hiding behind them to more stealthily approach the wild birds they were pursuing to get a closer shot. This practice has been banned since 1957. Answer: No, it is not legal to use any mammal (except a dog) or an imitation of a mammal as a blind in approaching or taking game birds (FGC Section 3502.) According to Capt. (ret.) Phil Nelms, hunters have long known the benefits of using cattle as duck blinds. 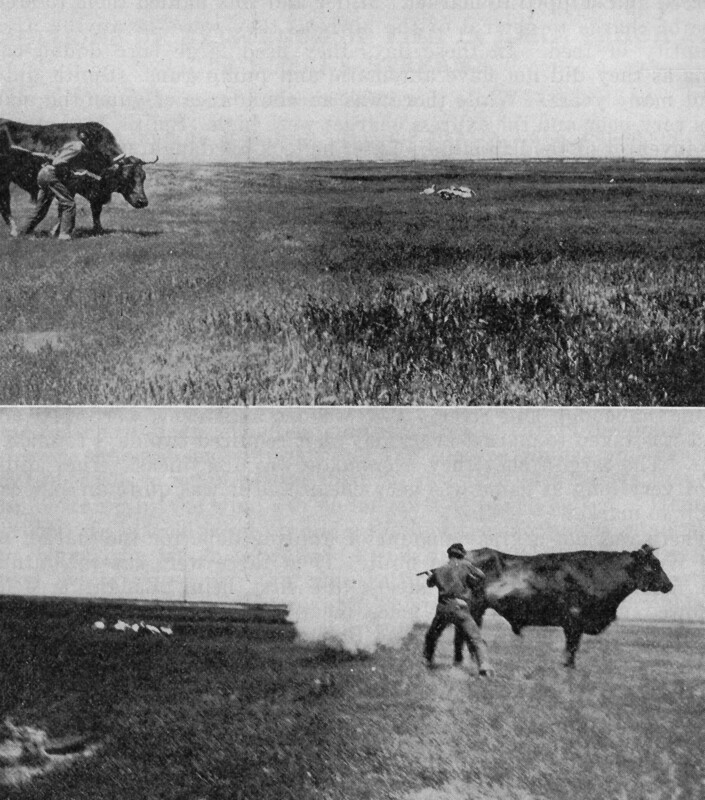 In fact, in the early days market hunters were known to train large steers to act as live decoys for them to hide behind while they “walked their shot” to approach the unsuspecting birds for a closer and better shot. One of the most famous live decoys was a hunting steer by the name of “Old Tom.” When his owner bought him in 1914, Old Tom weighed 1,850 pounds and stood 5 ft. 8 in. high. During the days of market hunting, he was utilized in practically every inland county in the state and made an excellent blind because of his training, size and build. Because of the high success of this method, market hunters were banned from this practice nearly a century ago, and sportsmen have been banned from this practice since 1957. For more, see the article of “Old Tom” entitled, “The famous animal blind.” California Fish and Game. 1928. Vol. 14:62 available online at http://www.archive.org/details/californiafishga14_1928cali. Answer: I can understand you wanting to maximize your fishing experience and harvest due to the troubled economy, however, a “bag limit” means the total that you can take in one day. And “possession limit” is usually the same as your bag limit (at least in ocean waters), so you are only allowed to possess one bag limit at any one time. In order to collect more, you will need to either consume or give away what you have and then fish on another day for more, up to the bag limit allowed. Why Do Fishing and Hunting License Fees Increase Every Year? Answer: California law establishes fishing and hunting license fees each year, not the Department of Fish and Game (DFG). The base fee for sport fishing licenses is established in Fish and Game Code Section 7149 and the fees for stamps and most report cards are established in other sections of the Fish and Game Code or CCR, Title 14 Regulations. According to License Program Analyst Glenn Underwood, the Fish and Game code requires license fees to be adjusted in response to increases (or decreases) in costs of goods and services using an index called the “Implicit Price Deflator” (Fish and Game Code Section 713). This index is a gauge of the change in the cost of goods and services from year to year. For example, as hatchery, law enforcement and wildlife management costs have increased, license fees needed to increase to keep pace with these rising costs. Essentially, license fees are adjusted to compensate for inflation. If license fees were not adjusted for inflation, then funding for fish and wildlife management and protection would actually decrease because the “buying power” of a dollar has declined over the years. License fee increases over the past five years have ranged from between 1.5% in 2005 to 6.5% in 2007. The average over the past five years has been 4.7%. Generally, the cost of goods and services increases at a fairly steady, slow rate. About two to three percent per year is common. In recent years, some costs have increased dramatically, particularly the cost of fuel. Because of this, the cost of goods and services jumped approximately 6.19% and 2009 license fees increased accordingly. If the cost of goods and services were to decrease, then license fees would actually decrease the same percentage. However, when is the last time the cost of living actually decreased? Although fishing and hunting license fees have increased throughout the years, the increase ensures that the DFG has adequate funding to manage California’s diverse fish and wildlife resources and provide the public with enjoyable fishing and hunting experiences. This entry was posted in Bag Limits/ Possession, Decoys, Info, Licensing/Permits/Stamps/Report Cards, Waterfowl and tagged fishing, hunting, Licenses. Bookmark the permalink.